We have been intrigued and fascinated by Google Now and all of its myriad possibilities since it was announced, and it seems that we haven't been the only ones. Popular Science has now named the new service as the Innovation of the Year, which is a pretty impressive award. Popular Science has tried to choose products that are deemed "milestones", products that fundamentally change something in our world. Some of the past recipients include: the digital camera, seedless watermelon, the Chunnel, the portable defibrillator, TiVo, SpaceShipOne, the genome sequencer, the Apple iPhone and App Store, and the Large Hadron Collider. Voice interfaces like Siri seem outdated by comparison. 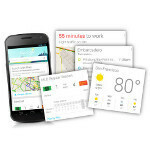 With Google Now, you don’t pull the phone out when an idea occurs to you. You pull it out when an idea occurs to it. Perhaps it's because we've said something very similar in the past, but we have to agree with Mr. Ward. Google Now may have relatively limited functionality right now, but it is growing fast, and the potential for offering us more and more information is always there. Well, that's explain why apple copied google allowing employees 20% work hours to be devoted to personal pet project. apple copy...apple copied... we are used its by now and i respect the only person from apple that admits it. innovation? microsoft tried to do this in the 90´s and it almost tore the company appart. that time the american government stopped them.. but apparently now its ok. i dont want some big corporation to now every thing about me, its not ethical to use people how ever they want, just becouse they now who we are! A talking google search function. I don't see how's that's more innovating than a virtual assistant. Its goes beyond it a lil by just giving you info based on some things you setup. Maybe even based on searches. And its extremely accurate. No Stallions with Google Now....lol. Google Now is like the notification shade on steroids...lol. Its innovation. Apple does it all the time....take existing technology, add their sugar and spice and release it to the world. Any Apple fan should appreciate this. Seriously....use Google Now and Siri and you will see the difference. Because you don't understand the point of Google Now, and obviously haven't read what I've written about it (which is hurtful). The point is that it isn't a "talking google search function", it mixes together search data, location data, and other things to give you relevant information BEFORE you ask for it. Thank you Mr Article Writer...lol. My comment wasn't really targeted at you Michael. I will give Now props for being intuitive in numerous areas. I wasn't trying to bash your article and I did have a chance to read it. As for the article, I can see where you're going here. Nice job, Google. Now has worked great every time I needed to find something out, and the voice is much more pleasant than a lot of computer interfaces. Well deserved credit, keep up the good work and wow us even further. As they should be. Definitely deserved it. Congrats Google, Google Now. After installing the JB leak on my RAZR, Google now is my new fav toy...lol. Now can we finally all agree that Google does maps and voice assistants better than Apple. I forgot to add...I get daily sport scores, I get driving routes to and from work, with warnings about traffic, weather info, I see you can also get info about meetings, travel, flights, public transportation, nearby places, movies, news, concerts... Thats all automatic. No asking about any of it...just set it to be shown and you are done. Google Now is simply amazing. I can not wait for JB on my One S. Why don't I root it, you say? Blah my GF has iMac and I just can not seem to root on OS X. I've tried Thunderbolt, Galaxy Tab 10.1, and One S. Failed every time. I watched the google i/o live on my computer this year and, when they introduced Google Now it just felt like something different. I have to say it did change the way I view smartphones. I honestly was thinking Google would come out with a Siri competitor. But I was (obviously) wrong. This feature is beyond anything ever produced on a smartphone. Google Now could, in the case of say an invasion of a country by an enemy army, push info too anyone with cell service (that has android 4.1+) the enemies movement and keep public updated so they could counter attack. Or feed a government daily route schedules, eating habits, work schedules, etc that would allow for a police state to take place. Granted, both of these scenarios are very extreme examples, and of course many more scenarios both inside and outside the box. But I believe this technology has the potential to do more than anything before it. And that is truly amazing. You're so full of it, it's seeping out of your mouth on onto your iPhone. Did you even read what Google Now is? SMH, such stupid remark for someone who seethes with hate for no reason. Popular Mechanics thinks that the way Google Now interacts it places it beyond Siri, Siri you have to ask it questions, Google Now is checks the area you are in and gives you relative information to where you are...think about it...yea, I'll wait! I get what you are saying. And you are right. Google Now goes a lil beyond what Siri is. I can see Apple eventually updating Siri to do similar. i am there a patent somewhere waiting to be violated. LOL!!! Play with the best die like the rest!! The future is with tech that knows everything about you; your name, age, DOB, where you live and work, what you eat, when you s**t. So thanks to google and Facebook, we are now part of of the collective. Such innovation. But I guess memory of us and our past as the end of the world is coming next month. Humanity will end. A new species will arise and Facebook and google will be lost and found past relic that these new species will discover of who they were in the past. I just want to reiterate... once these products/services from Google become self-aware; Do not try to pull the plug! We all already know how that turns out. Just... just smile and give it your cookies.